The Minister for Planning issued a Ministerial Direction on the Preparation and Content of Development Contributions Plans (DCPs) under section 46M of the Planning and Environment Act 1987 and reporting requirements for DCPs under section 46QD of the Act. 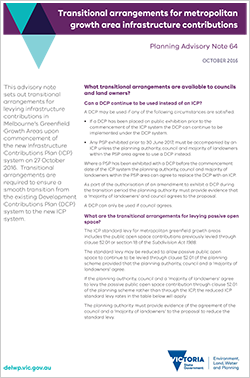 Transitional arrangements for levying infrastructure contributions in Melbourne's greenfield growth areas are in place from 27 October 2016 to 30 June 2017 for Precinct Structure Plans prepared before 30 June 2017 to ensure a smooth transition from the existing DCP system to the new Infrastructure Contributions Plan system. The Planning and Environment Act 1987 (Act) enables the DCP system to impose a community infrastructure levy (levy) to fund projects involving the construction of community buildings or facilities. Who pays the levy and when? The levy is payable at the building permit stage, or within a time specified in an agreement. Most developers choose to pay the levy at the earlier subdivision stage. Section 24(5) of the Building Act 1993 restricts a building surveyor from issuing a building permit if the CIL has not been paid. The maximum amount of the levy that is payable under a DCP (maximum levy amount) was increased from $900 to $1,150 for each dwelling by a Governor in Council Order made on 13 October 2016. For existing approved DCPs – it provides for the annual indexation of the levy amount provided for under the relevant DCP (payable dwelling amount). The changes relating to the levy came into operation on 2 July 2018. The first annual indexation of the maximum levy amount and the payable dwelling amount will occur on 1 July 2019. How is the CIL adjusted? Both the maximum levy amount and the payable dwelling amount will be adjusted annually using the Producer Price Index for Non-Residential Building Construction in Victoria. The Index is published by the Australian Bureau of Statistics. What is the adjusted levy amount for a particular year? It is recognised that the calculation of the adjusted maximum levy amount for any year is complex. To simplify the process, the Department will publish the adjusted maximum levy amount that will apply to new DCPs on its website on 1 July each year. The Act also requires a collecting agency (normally the council) to publish the adjusted payable dwelling levy amount for each approved DCP on its website on or before 1 July each year.